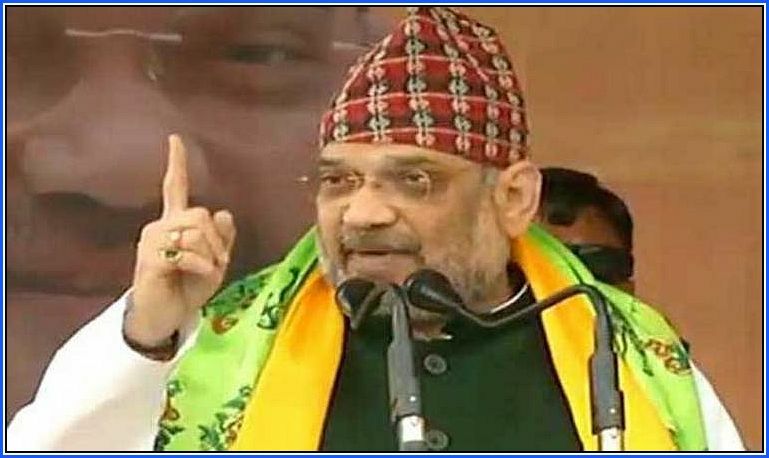 Kalimpong, Apr 11 (UNI) BJP national president Amit Shah on Thursday reiterated that Prime Minister Narendra Modi-led NDA Government has always been with the Gorkha community for their overall uplift. Addressing an election rally in support of the party's candidate here, Mr Shah said: "Our government is always with the Gorkhas all over the country as committed by the Prime Minister earlier in an election rally at Siliguri in Darjeeling district on April 3." "We are committed to extending citizenship to all the refugees in the region of the hills, Terai and Dooars. Those who have encroached on our territory, that is an infiltrator, would be shunted out from here," he asserted. Attacking the Grand Alliance, for which Trinamool supremo Mamata Banerjee has been campaigning to garner votes, Mr Shah asked Ms Banerjee to specify the constituents of the "Mahagathbandhan". "This Mamata Banerjee-led government has virtually done nothing for the development of the state and everything has come to a standstill, be it new industry or any other business. The tea garden workers are being subject to oppression by the present dispensation in the state for which the industry is being neglected since long," he said. Coming down heavily on the 'Syndicate Raj' in the state, he said: "Sheer lawlessness is ruling the roost in the state and there's not even a semblance of a system." "Out of desperation, the Trinamool workers are resorting to attacking BJP activists," he said. "We are always by the side of the poor and the labourers and we will always remain so."